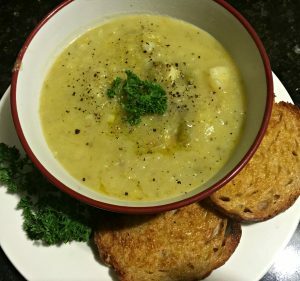 This incredibly simple recipe produces one of the tastiest vegetarian soups ever to have passed my lips. Take your classic leek and potato, and add the distinctive, beautifully complimentary flavours of fresh asparagus for a hearty and nourishing crowd-pleaser. 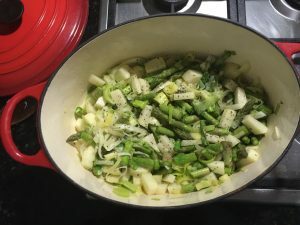 Prepare the vegetables by chopping the potatoes into small 2cm cubes, slicing the leeks, and roughly chopping the asparagus. Heat the oil/butter in a heavy based pot or saucepan on low to medium heat. Add the leeks, stir, and cook gently for a few minutes until soft but not browned. Add the potato and asparagus, and stir to combine and coat with the oils. Add the vegetable stock plus 500ml of water, bring to a boil then lower the heat to minimum, put the lid on the pot and leave to simmer for 20 – 30 minutes, or until the potato cubes are soft. Check the seasoning, serve, and enjoy with your favourite toasted bread.